Aung San Suu Kyi’s ‘silence’ on the Rohingya: Has ‘The Lady’ lost her voice? Having endured nearly 15 years of house arrest with grace and courage, Aung San Suu Kyi has earned a reputation throughout the world as a political superstar of rare moral stature. But for some, mostly from outside the country but also from within, the aura surrounding Myanmar’s most famous daughter has dimmed in recent years. 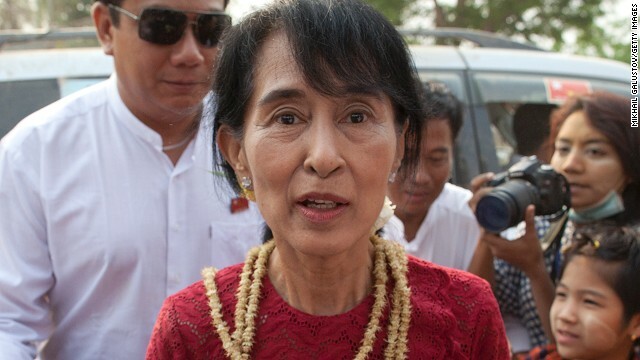 “I think everyone agrees now she has been a disappointment when it comes to human rights promotion,” said David Mathieson, Human Rights Watch’s senior researcher on Myanmar. But for some observers of Myanmar’s emergence from nearly half a century of authoritarian military rule, the 68-year-old’s perceived failure to speak out against rising violence towards the mainly Buddhist country’s Muslim Rohingya minority is grounds for criticism. Aung Zaw, editor of Myanmar news magazine The Irrawaddy, said that while she remained popular among Burmese, Suu Kyi had eroded some of her domestic support in recent years. Her failure to speak out on ethnic issues and the communal violence that had wracked the country was “shocking,” he said, and had been met with disappointment in quarters of the country’s ethnic communities. “People expected her — as she is a Nobel Peace Prize winner — to say a few words to stop the bloodshed,” he said. Ethnic conflict has been a recurring feature of Myanmar’s political landscape since it gained independence from Britain in 1948. But following the 2011 transition from military rule to quasi-civilian governance, the country has witnessed a significant spike in violence targeting Muslims, with Buddhist extremists blamed for fanning the flames of hatred.